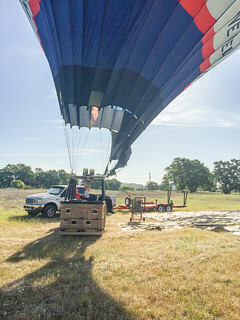 We had signed up with Wine Country Balloons. 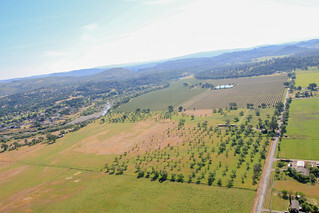 The meeting point was in Santa Rosa, which is a good 2.5 hours away from our place. So we decided to go a day before and stay overnight at Santa Rosa; that way we could be sure to be at the meeting point at 6:30 AM. There was a good turn out in the morning, around 20 (yeah, not a very personalized anniv celebration. But what the hell, it was fun!!). We all waited anxiously in the cold early morning hours for the pilots to turn up. And when they finally did, it was thrilling just to see the baskets we were going to go up in. Two vehicles were used to transport us from the meeting point to the launch site. It was an hour long drive to the launch site, along with a rest stop at a deli. I was glad there was a rest stop before the take off; there was no going up in the air and suddenly feeling the need to go to a restroom…that would be a bummer! And I wondered why some people bought coffee and soda at this stop. 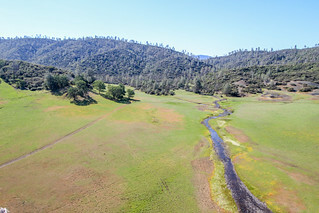 The launch site that day was near the Hidden Valley Lake in Lake County. 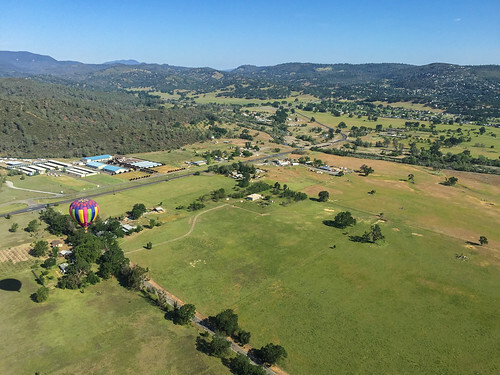 This is much north of the other popular spots for hot air balloon launches in the Napa and Sonoma valleys. 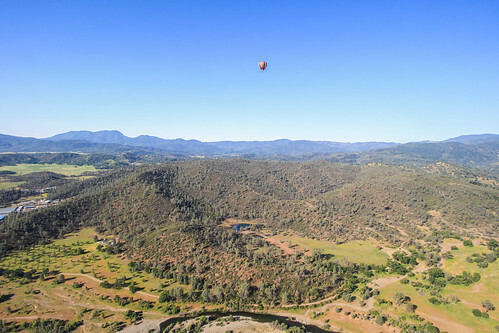 The hot air balloon company chooses a launch site based on the cloud, fog, and wind conditions on the day of flying. On the day of our trip, Hidden Valley seemed to work out. Apparently, Mt St Helena, which is south of the Hidden Valley Lake, helps to keep the fog out. 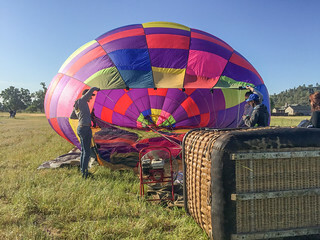 The pilots had a lot of helpers to get the balloons inflated and ready for flying. The whole process took its own sweet time. But the wait was worth it. 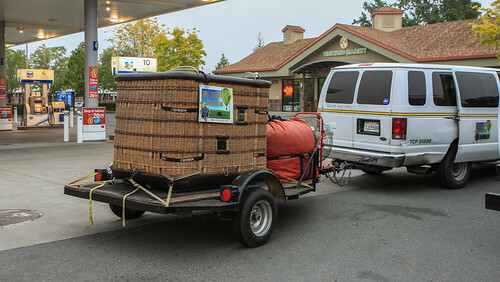 The bigger balloon, called the Blue Star, can carry a basket that has a capacity for 20 people. The basket has four compartments. Thats the one we flew in. The smaller, multicolored one is called Rhapsody and can carry a basket of five people (including the pilot). The takeoff itself was such a gleeful moment. 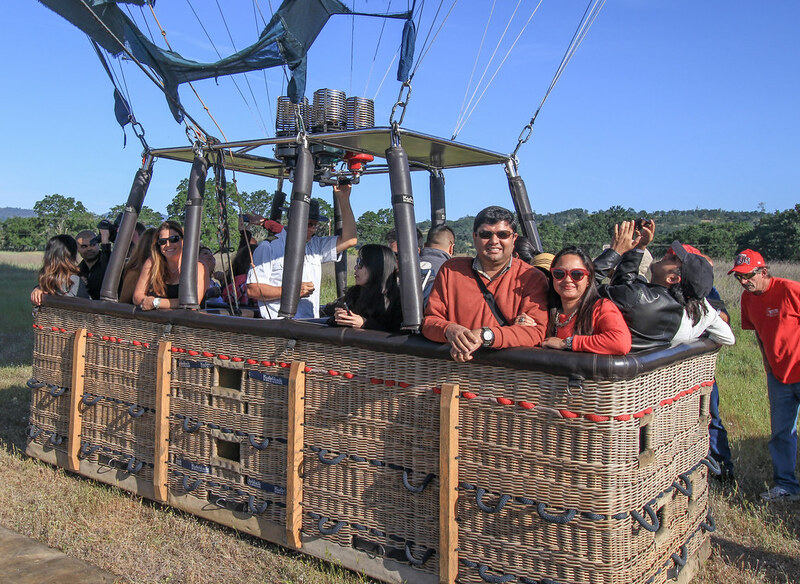 That split second when the basket lifted up from the ground and then when we slowly started rising in the air, it felt as if my heart had stopped beating out of excitement. 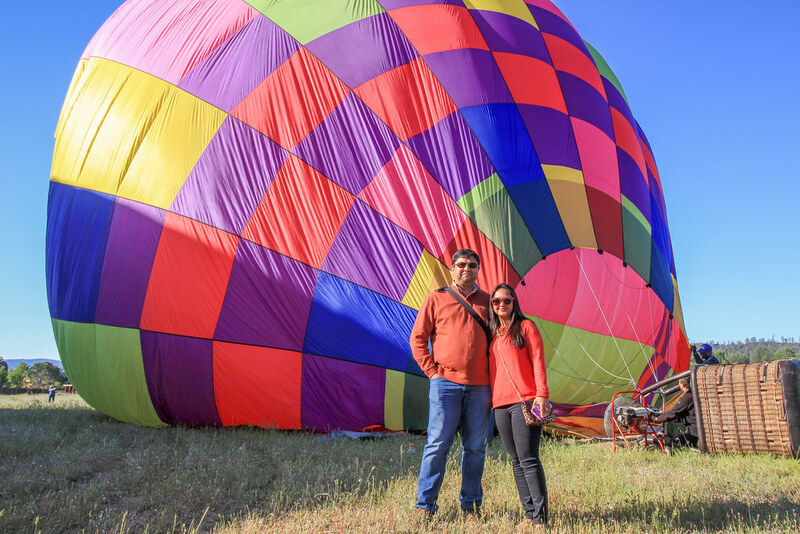 Once it felt real, that we were up in the air, and were going to be floating around for a while, I started taking in the breathtaking views. It was amazing. Everything around. 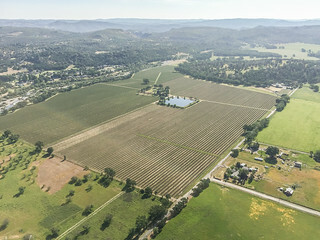 The hills, the orchards, the green patches, the creek, the highway, the houses. Just like how it looks from a plane right after take off — all ground objects appear smaller and you’re able to see a larger area — except in this case, we were not enclosed inside a cabin. I could feel the wind and sun. And I could get a 360 degree view from up in the air. From time to time, we could catch glimpses of the other balloon. Being smaller and lighter, it flew in a direction very different from ours. In fact, it flew much further ahead over the mountains. 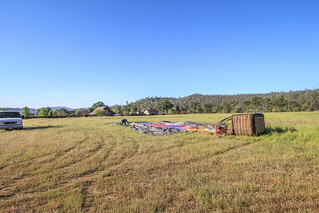 And thats the thing about flying in a hot air balloon; each ride is different and distinct from any other, even on the same day and from the same launch site. 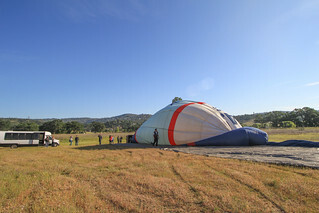 The balloon takes its own course based on the air current on a particular day and hour. 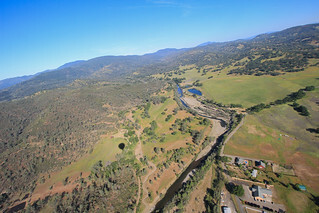 We were lucky to fly on a clear, sunny day. The view was mesmerizing and enchanting. It felt so surreal flying over the hills and greens. I wish I could spend a whole day just floating around in air. I also wish the baskets had chairs to make the experience more comfortable :P.
After an hour of cruising around, the pilot started looking for a good, non-rocky, and flat spot to land. By this time, the chase vehicles were also in sight and they were following the course of the balloons. I was a bit apprehensive about the landing, but quite surprisingly, I didnt feel a thing. 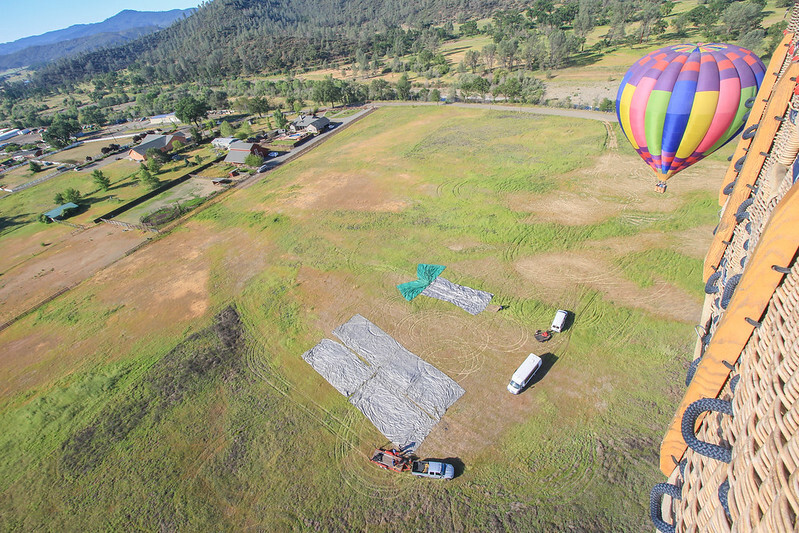 Post landing, it took a while for the crew to deflate the balloons and pack them all up. We were in a bit of rush to get back to the hotel as we were nearing the check out time. Unfortunately, because of our particular rush, we even missed the brunch and champagne (part of the package) that was planned after arriving back at the morning’s meeting point. In summary, it was a marvelous adventure, one that we would love to experience again.